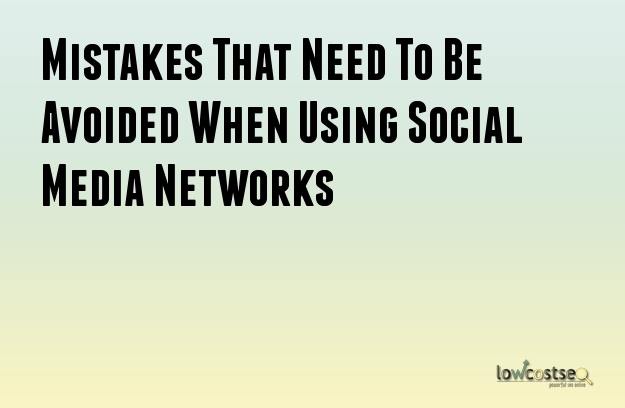 Social media networks can be extremely useful for increasing the online presence of a brand. They can create additional leads and sales opportunities while increasing the traffic to your website. However, if you want it to grow into a bigger entity through the use of the internet, you need the help of social networks. Be that as it may, there are certain pitfalls which need to be avoided at all cost when marketing through social media networks. Since you will be using these networks and platforms to market and grow your business, it becomes critical that you are doing the right thing in order to get the best results. You may be running a small business. Using a single network is like putting all your eggs in one basket. There are many social networks being used today such as Facebook, Google Plus, Instagram, Twitter and so on. If you are using only a single social networking website, you are limiting the reach of your marketing campaign by a significant margin. The fact is that, people use those social networks they are comfortable with. Even though some networks are more popular than others, it does not mean that all your customers will be in those very websites. Spread out and create profiles in different social networks in order to get the most benefits. Since it is important to have multiple social networks in your repertoire, it is easy to believe that profiles for your business should be created in as many social networks as possible. That is a scenario that is best avoided. Your customers will not be present in all the social networks that available nowadays. That means your marketing messages will have no value in those unused networks. It will be a waste of your time and effort. Additionally, it can be extremely difficult to formulate a marketing strategy that involves the use of all these networks. You will not be able to give sufficient attention to each network which reduces the effectiveness of your marketing plans. Instead, you will have to carefully select the networks. Choose only those where your customers are most active in. Your customers will follow your business in the social networks because they want to more about your company. They are not going to be interested in your views regarding events or other items. At the same time, the content should not and being misinterpreted as being offensive. You should only post content that is relevant to your business. The content should be interesting and informative so that your followers get some value out of it. Additionally, it will be preferable if your content makes your followers engage and interact with you. It increases the chances of making your marketing messages a success. Social networks can be powerful tools for any marketing department. They just need to be used in the proper manner. Avoiding mistakes will help you improve the effectiveness of your marketing strategy.